Our latest line of 4-Roll Plate Bending Machines offer many decisive advantages. 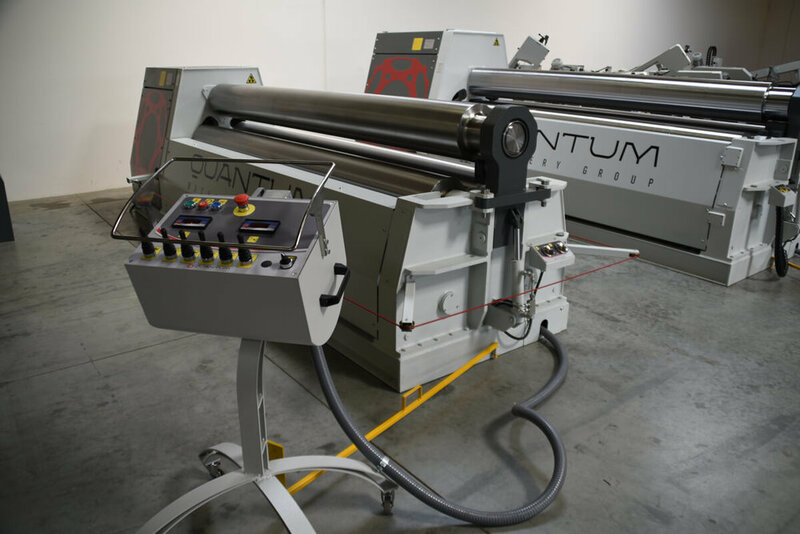 The Quantum Four Roll Plate Benders are the easiest to operate plate bending machines in the market - thanks to our ability to pinch the plate between the 2 central driven rolls, pre-bend the leading edge, and rolling the body of the part along with the trailing edge all in one direction and in one pass. The plate is kept square, without slipping, during both pre-bending and rolling cycles because of the constant clamping of the bottom and top rolls. This makes our four roll machine perfectly suited to be controlled by a NC or CNC control. Rolls movement at variable speed from 0 to 100% (excludes machines with electro-hydraulic controls). This Quantum machine is reliable and effective. Side roll parallelism is maintained by a torsion bar system which connects both ends of the roll together, eliminating the weakness of extra encoders and hydraulic circuits. Our 2 central rolls are driven by hydraulic motors and high efficiency planetary gearboxes, coupled directly to the rolls. The Quantum solution (along with the rolls being mounted in low friction sealed bearings) greatly reduces the torque lost by clutches and synchronization systems used on other machines. The ultimate evolution in the plate bending field. Two dragging rolls with hydraulic pinching granting a steady and precise material dragging. This plate bending machine is the easiest, the most versatile, the most precise, and the quickest machine the market can offer. The Quantum MG 4 Roll Plate Bending Machine is characterized by its very user-friendly interface. Automatic Simultaneous/Synchronous Balancing: Our bending rolls parallelism is controlled by massive TORSION BARS working in symbiosis with sophisticated valves controlling the oil flow . This system grants the complete and steady parallelism, in every working environment and conditions. Planetary Movements: Bending rolls planetary movement that reduces frictions at minimum, frictions very common on traditional movement machines, such as diagonal or horizontal sliding guides. Direct Drive Motorization: Replacing of all low efficiency components (gears, bushings, mechanical gear boxes, transmission belts, sliding guides…) with the most efficient epicycloidal gear boxesDIRECTLY COUPLED on the rolls, bearings and hydraulic motors, this way all machine strength is focused on the material to bend (positive strength) with consequent Energy saving. This system conforms to the “International High efficiency and Anti-Pollution” standards. A 4 roll plate bending machine motorization is made of two hydraulic motors, directly assembled to the rolls by particular motion transmission gears and gear boxes that gives the maximum performances with the minimum possible strength. The motion is given to the motors trough a hydraulic pump, which is set in action by an electric motor, it is successively given to the inductors and then to the rolls.Furthermore, motorization is very important during the pre-bending phase, it allows to position the plate at the center of the rolls with the maximum precision, without losing it. This is due to the fact that we are using a 4 roll machine, and can pinch the plate with the central rolls, thus, to get a pre-bending that will not be over 1.5 or twice the plate thickness itself. Rolls Cambering / Crowning: Quantum's technology allows the application on rolls of a variable cambering on the basis of material thickness. Each Quantum machine is different, because its rolls do not have the same cambering / crowning. During the bending work, the rolls get subject to deflection but (thanks to the cambering) they do not reach the breaking point, and grant perfect results in their bending performance. Our machines have a special support, to roll a conical shape guiding the shorter edge of the plate to rotate. The best solution for bending perfect cones is our 4-roll machine with CNC: its bottom clamping roll can be tilted, to form the cone (funnel) shape wanted. Conical shapes with a conicity over 4 degrees reduce the machine performance: this is due to the unbalanced load on the top roll and its bearings. Tight Minimum Diameters: Our planetary geometry can get the minimum possible diameter in plate roll bending. By using exclusive planetary guides, we are able to keep 50% more area of the plate under bend pressure during the rolling operation, allowing the Quantum Plate Rolls to roll down to 1.1 the upper roll diameter. For instance: Top Roll = 300 mm -------> Minimum Diameter = 330 mm. Plate thickness can influence the final result. Using a machine with maximum capacity 100mm, on a 3mt length, if we wish to bend a plate working at the maximum capacity, the minimum possible diameter we get is 3 times the top roll one. But if we use the same machine at 60% of its maximum capacity (bending a 3mt plate with 60mm thickness), now the minimum diameter we get will be very tight: only 1.1 times the top rollØ . As you can see.. There are many Unique Versatile Features that our NC Control has to offer. The Quantum NC Nexus control allows for the POSSIBILITY to store presets and quickly recall those presets with ease. 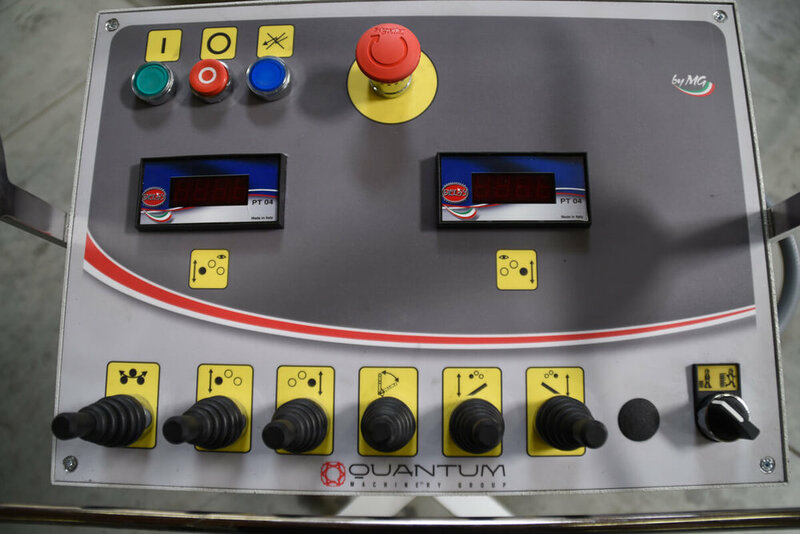 This video demonstrates features and ease of use of the Quantum NC Nexus Control. Quad core 1.6 GHz Arm low power fanless industrial. Expandible I/O for additional axes.